I'd like to offer at this time my personal opinion in regards to our immigration policies. First of all the Mexican undocumented worker is a refugee from poverty and hunger just as the Hungarians, Viet Namese, and Cubans were refugees from political suppression. Mexico's economy is dependent upon that of the U.X. because the USX. MONOPOLIZES MUCH OF Mexico's industry, and is a drain on its resources. The U.S. has always dipped into the Mexican cheap labor market when it has been economically advantageous, and when the ill winds of reaction are stirred up, then our immigration policies become stricter and discriminatory. In fat our country has a history of racist immigration policies. In 1849 Mexican gold miners were divested of ownership of their mines and deported to Mexico. The Chinese Exclusion Act of 1892 barred the Chinese for entering this country when coolie labor was no longer desirable. In fact the old saying, "You don't have a Cinaman's chance." was true then. Later recruitment of the Japanese as a cheap labor source fanned the fires of bigotry and led to the Exclusion of Japanese in 1924. 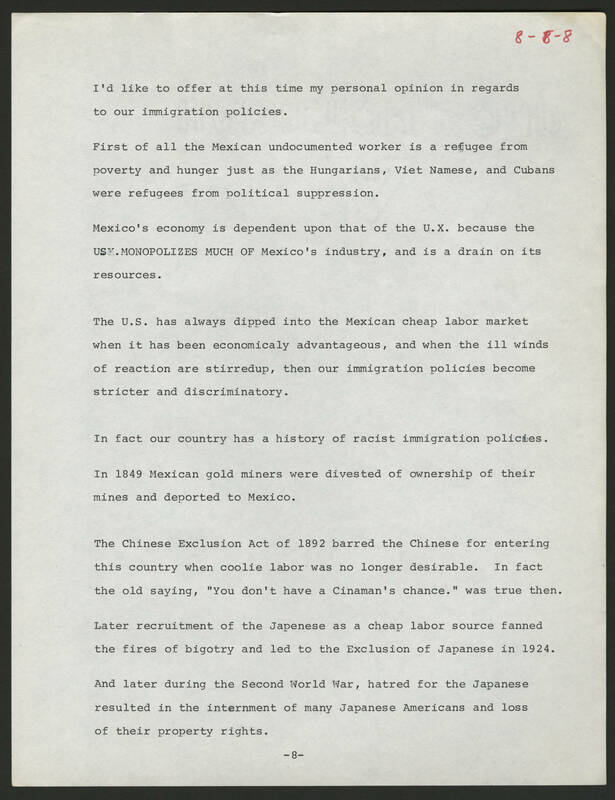 And later during the Second World War, hatred for the Japanese resulted in the internment of many Japanese Americans and loss of their property rights.